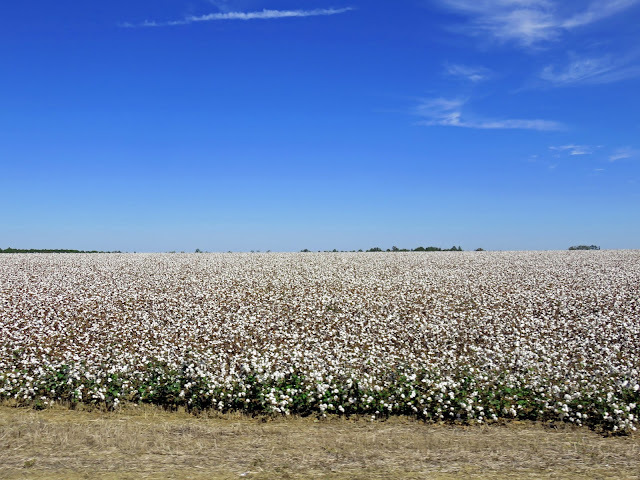 A field of cotton in the Southern Rivers area of southwest Georgia. "Such was Georgia's preeminence in world cotton production at the turn of the 20th century that the international market price was set at the Cotton Exchange in Savannah. And the huge plantations of southwest Georgia were major players in the engine driving the state's economic prosperity. For more than 100 years from the first time it was planted in Georgia in 1733 until the beginning of the Civil War, cotton was the most commercially successful crop in the state." Today, Georgia is the second largest cotton producing state in the union - Texas is the first - and Georgia farmers planted 1.38 million acres of cotton in 2014.